Happy Tuesday dolls! 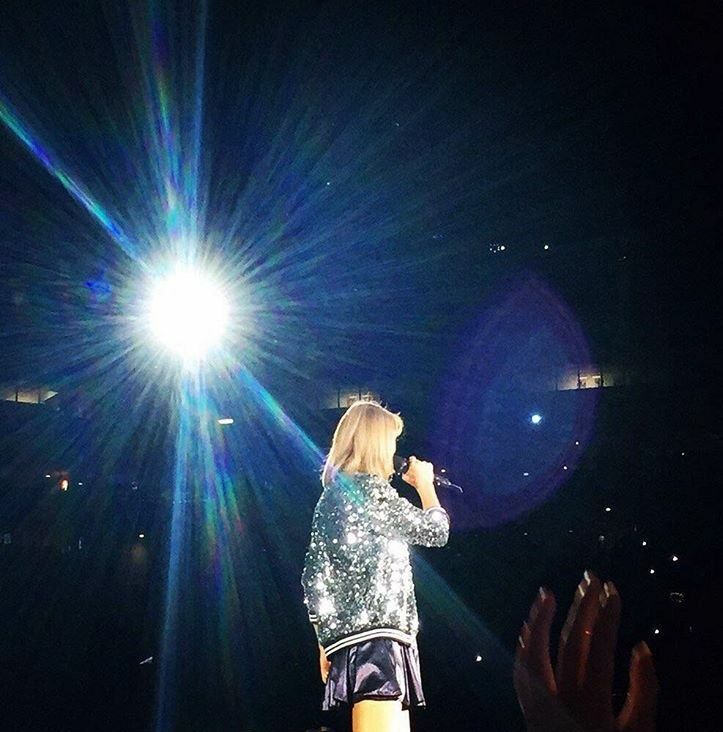 Going through my pictures from Taylor Swift's 1989 Tour got me super excited and sad at the same time. It was such a great concert but I'm so sad it's over. There was so much build up and waiting and then just done in a few hours. Totally worth it though! I told you I'd share all about our concert experience in detail so here it is. Since our stop was the last stop on the tour I'm not worried about spoiling it for anyone because everyone who is going has already gone by now! Be prepared, it's picture heavy! We arrived at Raymond James Stadium just before the concert was supposed to start. Luckily we had a parking pass in the luxury suite parking lot so we didn't have to fight any one for a parking spot or have a mile trek to the stadium. Once inside we went straight to our seats to get our LED bracelets that every concert goer receives. These bracelets flash to the beat of Taylor's music creating a seriously magical experience. After grabbing our bracelets we headed up to our luxury box to get a drink and get comfy during the first two acts, Vance Joy and Shawn Mendes. After they were done performing there was a short break so Kerri and I hightailed it back to our floor seats to get ready for the main event. Taylor opened with Welcome to New York which wasn't a shock to me since I had already sneaked a peek at the set list and from experience with her previous shows. After WTNY she went straight into New Romantics which is one of the bonus songs on 1989. I prefer Wonderland but I'm not complaining! After IKYWT she jumped into How You Get The Girl which I tried to get pictures of but she was wearing this ligh up outfit and the lighting was low so no such luck. Kerri got this awesome video of the crowd though. Can we talk about how awesome those bracelets were?!? 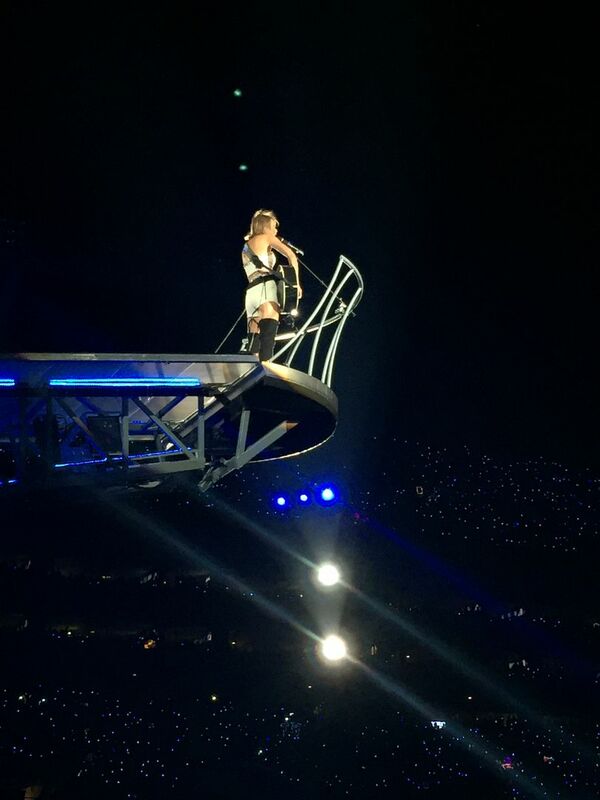 Next Taylor decided to do some elevated singing on this platform that allowed her to fly over our heads while performing. She did an acoustic version of Fifteen, Clean (which happens to be one of my favorite songs from 1989) and Love Story. Pit stop for a costume change and what do you know, Taylor comes out performing Style dressed as Olaf from Frozen. At first I thought "ok, it's Halloween, why not?" but then I started to think something was up and it was time for another special guest. What do you know, I was right! Taylor surprised us next with Idina Menzel who you all might know as Elsa from Frozen. They performed Let It Go and had a quick change during the song which was pretty amazing. After another quick wardrobe change it was time for Bad Blood which Taylor really got into then a very dark, rock version of We Are Never Ever Getting Back Together which I am now obsessed with! Next up was another wardrobe change (girl has a very extensive wardrobe for this tour, and I'd love to raid it when she's done) for a mashup of Enchanted (which happens to be one of my all time favorite Taylor songs) and Wildest Dreams. I missed getting the beginning of the song because I was too busy freaking out to Kerri about it. Next homegirl took the floofy skirt off and rocked just a sparkly body suite a'la Britney Spears in Toxic and performed Out of the Woods. 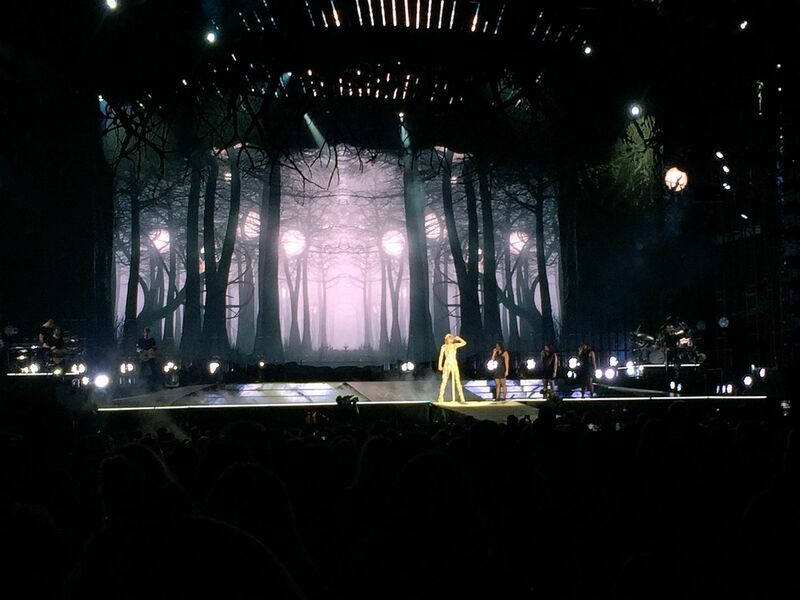 The set for Out of the Woods was AMAZING and loved all the little effects they did. Last but not least was Shake It Off. Way to go out with a bang! Taylor seriously let loose and went all out for Shake it Off. There were fireworks, there was confetti, dancers dressed up like Yoshi, Spiderman and even Mickey Mouse twirled above our heads. If I can say one thing about Taylor's concerts, she puts on an amazing show. You definitely get your money's worth and she makes sure you are entertained. Between 1989 and Red it's hard for me to say which tour I preferred. I think I liked the venue of Red more (it felt more intimate with only like 20k people instead of 55k) and Red is still one of my favorite albums she's ever released but I had the best company during 1989 and it was so fun to get to make a little trip out of it. Ok, I'll stop talking now since this post is already WAY too long. 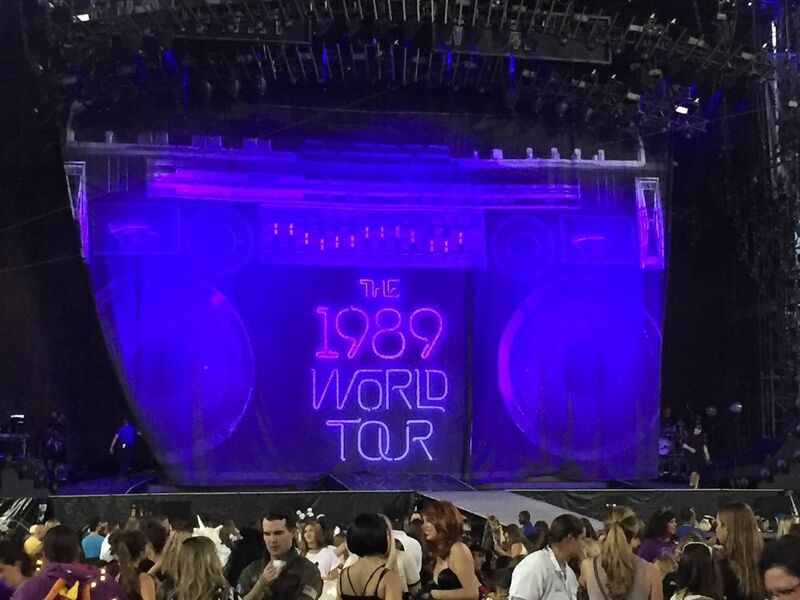 If you went to the 1989 Tour what did you like best about it? Oh my goodness this looks like the best concert. I've heard Taylor knows how to rock a show, but this is pretty amazing. You had such incredible seats, girl! Thanks for all the videos, I feel like I was there for a hot second, haha. So glad you had a great time! ps.com Enchanted is one of my all time favorites too!!!!! Wow! Was waiting for this post hehe... Love outfit changes!! You were soooooo close! Those photos are amazing! You guys definitely had some good seats to get some great shots! So glad that you had a good time--my nieces all went to see her this summer and LOVED it! How cool that they give you bracelets that go with the music?? I bet that was awesome! Can I also raid her wardrobe?? Want it all! Ah, SO AMAZING! So lucky you got to go! Going to one of concerts is on my bucket list now! And I will be going all out for amazing floor seats like yours! She seriously goes all out for her concerts and it looks sooooo amazing!!! All of her outfits are so cute too! Still love that she dressed up as Olaf when Idina came out! So fun!!!! That was a great round up! Loved hearing about what set list she used and all her costume changes. Out of the Woods is one of my favorite songs on her current album, that and wildest dreams which will now be totally over played but oh well. 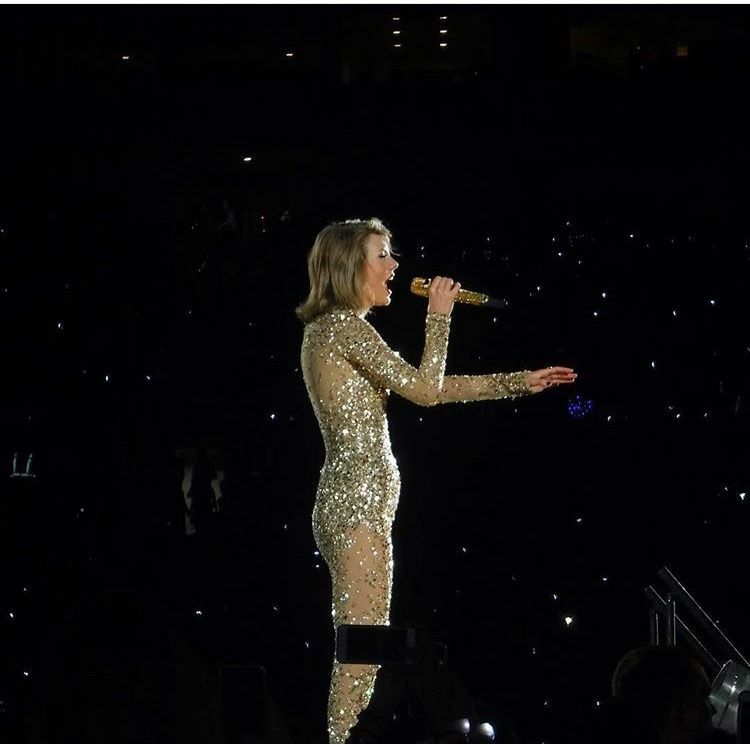 That sparkly cat suit looks amazing on her. you know how i feel about this trip together - beyond amazing! take me back already! great round up of course :) love u! Damn, she really goes all out for a show! I love it! I just need to go to a Taylor Swift concert. Is that a plus to having kids super young so Avery and I can go together and I won't feel super old? I am SO sad that I didn't get to go to her concert! It looks like it was pretty much the best thing ever... and a mashup of Enchanted/Wildest Dreams?? Love it. this concert sounds incredible!!! talk about entertainment! even if someone wasn't a fan, i know they'd have a good time! Such fun! Taylor looks like just the best performer. You guys had the best seats and look like the best time too! I love that she dressed up as Olaf and did the whole frozen thing - her surprises are always the best! Wow this looks like SO much fun and you have to hand it to Taylor for having the MOST surprise guests ever! So cool!! My daughter watched that "Elsa" clip about a million times ;) We're big Taylor AND Elsa fans around here! Oh man this sounds like the best concert, like ever! I love the LED bracelet thing I had no clue, but what a neat experience. Wildest Dreams is seriously my jam right now I can't get enough, I'm considering it for a cake cutting song :)! Glad you had fun girl!! ahhhhh i am so jealous. thank you for recording it and detailing so fabulously, i felt like i was there. my favourite bonus song is you are in love, swoooooon. anyway, sounds AHmazing. one day I will see her! Taylor is amazing. I wanted to take my daughter when she was here but we were out of town. At 4 she knows the words to almost all the songs on 1989. All her Insta photos of her shows were just awesome. Love her and so jealous you guys got to go to the last stop on her tour. What a FUN show! Taylor is such an amazing artist + performer! Glad you had a blast, girlfriend! These are some great pictures! So jealous you went -- I tried to get my husband to go with me haha! She is so talented and I love all her music! Ah SO MUCH FUN! That concert looks like it was a blast - your seats look awesome too! Could she be any more fabulous?!? Love the videos! My friends had went to her concert in Detroit right before we went to Nashville this summer and brought along the light-up bracelets - we had way too much fun with those things! Oh wow now THAT'S a concert!! I love all of her wardrobe changes and how Idina Menzel was there!! I'm dying with jealousy reading this post!! I had seen on Instagram that she had Idina Menzel show up as her secret guest - that must have been so cool to see! But besides that the setlist (and set!) alone are amazing! SO awesome!!! I feel like I was there now!! ;) Sorta hehe. Sounds like an amazing time! i wish I could have gone this year. Lucky you with the luxury seats and parking! I'm loving her glittery bodysuit! Well thanks for those videos! Totally felt like I was there. (; I totally need to see her in concert! Excuse while I relive her performance in Houston and the to imagine how much I'd be freaking out if Idina Menzel walked on the stage! That's so cool that y'all were the last stop on her tour, and it definitely seems like she went all out! I loved that she still did some older songs, but especially Love Story (it was super popular around the time that I got engaged to my husband). This is definitely one for the books! I enjoyed your IG pics over the weekend, sounds and looks like such an amazing show! I have never seen her in concert, but I love a good performance...and wardrobe change. What great pics and videos, thanks for sharing...I enjoyed hearing about it! Omgsh seriously looks like the best time ever!! She is so fabulous--gimmie that outfit she wore for shake it off--obsessed!! Taylor Swift and Olaf combined ♥ LOL! I love the song Wildest Dreams the best on her 1989 album. It's been a year I think but I'm still listening to it. What an amazing concert!!! I cannot miss her when she comes again!! Thank you for sharing your entire concert experience - I feel like I was there with you now! She seriously looks like she puts on a fantastic show - I LOVE that rock-ish version of We Are Never Getting Back Together. So glad you had fun, lady! Wow that sounds like an amazing concert! So jealous! She's so talented and beautiful! Glad you had fun!